Entry requirements for Uzbekistan were eased in 2018, and further eased in 2019. More countries get the visa-free treatment, e-visas have been introduced, and more nationalities can enter Uzbekistan without an additional letter of invitation. Do I need to print it? Many things that are legal in your country are illegal in Uzbekistan. For important info when entering Uzbekistan, see Uzbekistan border crossings. All questions and updates can be posted in the Uzbek visa-free forum topic. As far as we know there is no restriction on the amount of times you can exit and re-enter Uzbekistan visa-free. As far as we know there is also no restriction on the amount of time you need to be outside of Uzbekistan before you can return. So same-day visa runs should be no problem. Data points are collected in the visa runs forum thread. Citizens of the following countries and territories do not require a visa for a 5-day stay if they are transiting through the international airports of Uzbekistan (you need to fly in and out). According to the IATA Timatic the outbound flight from Uzbekistan must be on Uzbekistan Airways (meaning, not the inbound flight). We are looking for updates. All questions and reports are welcome in the visa-free transit forum topic. There are 2 ways to obtain a tourist visa to Uzbekistan: via the e-visa website, or through an Uzbek embassy. All others need to go through an embassy, and apply for an additional letter of invitation from a tour company as well. The e-visa is single entry. The duration of the visa is 30 days within a 90 day window of validity. The start date of the visa validity is the date you send in your application, not the date you receive your visa or the date you intend to enter Uzbekistan. The price is 20$. It takes 2-3 days to issue the visa. The e-visa works at all entry points: land borders and airports. No sticker is placed in your passport, only an entry/exit stamp. You do not have to enter on the first day of the visa validity, or leave on the last day of visa validity. You can enter Uzbekistan at any point within the 90-day window and leave at any time within the 30-day duration of the visa, as long as it is within the 90-day window of validity. As an example, let’s say your visa validity is 1 January – 30 March. If you enter on 15 January, you can stay until 13 February (30 days). But you don’t have to stay 30 days, you can leave earlier. However, if you enter on 15 March, you CANNOT stay until 14 April. You have to leave at the latest on 30 March. This is the official e-visa website where you should apply. Although people have reported success in receiving the e-visa, the website is still very buggy. Travelers report problems uploading pictures, receiving activation links, payment failures and difficulties printing. It is difficult to predict what the problem (if any) will be for you., and what the solution would be. Not everyone succeeds in getting their e-visa, some people have to revert to getting it via the embassy or using a third-party operator to do it for them because it simply did not work via the website. Others have ended up paying several times. Apply well enough in advance. When the e-visa form asks for “Preliminary place of residence in Uzbekistan”, you can write a random hotel (name, street address and city). You do not have to stay there. Pictures: upload in .jpg format (not .jpeg, not .JPG, but .jpg). Other tips include a perfectly white background, resizing to 413x532px, and cropping so your head takes up almost all of the frame, 300 DPI and less than 1MB. Someone else has reported 35mm at 45 mm. Useful apps are Persofoto, Passport size photo ID and Tinypng. Windows and Android have been more successful in uploading pictures than Apple. If you have troubles with the Captcha it might mean the information you provided in the form is wrong rather than the Captcha itself. Home address and workplace address cannot be the same. After filling in the form, some people do not receive an activation code. Not all e-mail domains work: Uzbek support staff recommend a gmail/msn/yahoo email. Some report issues with yahoo and msn as well but gmail has worked well for everyone so far. If you are applying for someone else’s visa, use a different e-mail account. For some, the activation link does not work. You can just go to the application page and copy/paste the code provided in the application email. Be aware the link expires after 12 hours (perhaps less). Once you have received the activation code, you can return to the website to pay. Only Visa has been reported to work. Many people have reported receiving a payment error. In the end, though, it turns out their payment often went through and they received their e-visa after 2 days. Your bank may block your payment because they think your account is hacked. You may or may not receive a confirmation e-mail after you have paid. If it all still does not work, Ivisa has been recommended as a solution. You pay 20$ extra and they fill it in for you. Experience reports point to a good service. Updates and questions are welcome in the Uzbek e-visa forum Q&A. Uzbekistan is planning to introduce double and multiple entry e-visas in March 2019. Until that time, you cannot apply for 2 separate e-visas before entering Uzbekistan. If you want a multiple entry visa, you will still need to apply at an embassy. You can, however, apply for another e-visa once you have arrived in Uzbekistan, same as with the Tajik e-visa. People have done this in the past: it works, and unlike in Tajikistan, it is not illegal, so there is no need to hide it. It might be possible to apply for 2 e-visas simultaneously if you have double nationality. Although officially you do not need a hard copy of your visa and can simply have the visa on your phone, it is advised in the early stages to print it. Border guards know about the e-visa, but train ticketing agents and police officers do not know about it yet, and might cause trouble. If you cannot apply to the e-visa website, you will need to apply through an embassy. To do this, you might first need a letter of invitation. Unlike the e-visa, an embassy visa does not have a 90-day window of validity in which you can use your 30 days in the country. An embassy visa is fixed date and valid for 30 days. You fill in the dates you want on your application form, and these are the dates you will be granted to visit Uzbekistan. Like with the e-visa, you do not have to enter on the first day the visa starts, or leave the last day your visa ends. You can enter Uzbekistan at any point within the 30-day duration of the visa. But you definitely need to leave before or on the date it ends. Don’t leave after it ends. This means that if you have a 30-day visa but you do not enter on the first day, you cannot stay for 30 days, you can only stay until the end of your visa. That is the meaning of the word fixed-date visa. As an example, let’s say your visa duration is 1 January – 30 January. If you enter on 15 January, you can stay until 30 January, not until 13 February. In the past, citizens of 15 countries did not need a letter of invitation to apply for their Uzbekistan tourist visa at the embassy. Does that mean that from February 2019 the 76 new e-visa countries will also be able to go without a letter of invitation? We assume so. If you have a LOI, you can usually get the Uzbek visa the same day or the next day (see embassy reports for details of each embassy). If you do not have a LOI (meaning, if you are from a country that does not need one), it will take longer. Previously, 2 weeks was standard, but since 2018, reports indicate a wait of only 3-5 days for travelers without LOI. It depends on your embassy (again, see below for reports). It is also possible to apply in one embassy and pick it up in another one – another option to avoid long delays. When picking up the visa in the second embassy, you will have to fill out the application form again. Don’t worry, you are not starting the procedure again, you will get your visa the same day. They just need the paper. After acquiring the letter of invitation, you can go to the embassy. First, however, you need to fill in a form online and print it. Confusingly, the website where this form is located is also called the Uzbek E-visa website. You cannot get an e-visa through this website, though. After you fill in your data in the form on the site and print out the form, you take the print-out to the embassy of your choice for your visa application. Theoretically, you cannot apply more than 3 months in advance. Those 3 months start from the moment you fill in the e-visa form. Many embassies allow you to apply earlier, but some are strict about this, for instance, the London embassy. For a transit visa, proof of onward travel is needed. People tend to get confused about the Uzbek application form. Address in Uzbekistan: name of a hotel you are staying, or pretend to be staying at. Hotel bookings are not usually checked at the embassy. Passport picture: there is no need to upload a picture to the form, you can simply bring a passport picture to the embassy. Address: if you do not have an address, fill in an address of somewhere you used to live. Nobody checks. Employment: if you do not have a job, fill in a job you used to work. Nobody checks your references. It is possible to get a double entry visa simply by paying 10$ extra. The two entries are on the same visa for the 30 days, not two separate 15 day visas as was the case in earlier times. This means you get 30 days to visit Uzbekistan, for instance from 1st of January until 30th of January. In this time you can exit and re-enter Uzbekistan, but you must make sure to exit Uzbekistan before the 31st of January. Questions and reports in the multiple entry visa forum topic. The cost for the tourist visa has officially been lowered to 40$ in December 2017, with double entry 10$ extra. Usually, though, price at embassies tends to be 55$. Americans and Israelis pay 120$ to 165$, Japanese go for free. It is possible to apply for a visa in one embassy, and pick it up in another one, similar to the Turkmen visa. Generally a simple and easy-going process and recommended for people on the go who cannot wait around. 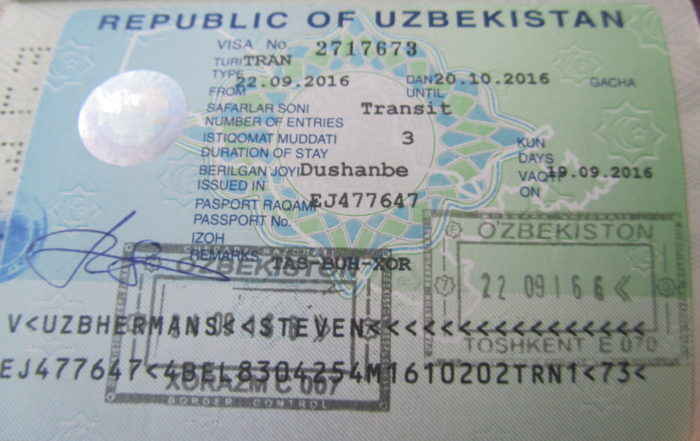 It is possible to get a visa on arrival in Uzbekistan, but only at the airport of Tashkent (perhaps Termez, but not certain). Single or double entry is possible. There are several requirements though. You need to have a letter of invitation stating you will get the visa at the airport. Also, the info provided to airlines says you need two passport photos, so bring them to ensure you can board the plane to Tashkent. When entering from a land border into Uzbekistan, visa on arrival is not possible. If you normally do not need a LOI, you will still need one for the visa on arrival. If you make a small stopover in a country where there is an Uzbek embassy (but not long enough to reasonably get a visa), you can still apply for the visa on arrival. Basically, once you hold an LOI with a stamp from the MFA saying the visa will be issued in Tashkent, you will be allowed on the plane, and you will not be turned back at Tashkent airport for having departed a country with an Uzbek embassy. Questions and reports are welcome here. These visas are not electronic for now, you will need to get in touch with an embassy to get one of these. All info has moved to this page: transit visa for Uzbekistan. Since July 2018 you can apply for a business visa and stay up to 1 year in Uzbekistan. You will need a business letter of invitation which is valid for 3, 6 and 12 months, but no other documents. Children under 16 don’t need visa to travel to Uzbekistan. They should be registered in the visa application of their parents. A 2-year visa for natives of Uzbekistan and members of their families. An invitation from a relative permanently residing in Uzbekistan is required. A student visa is a 1-year visa for foreign students enrolled in educational institutions in Uzbekistan. An academic visa is issued for a period of 3 months to 2 years for foreigners conducting research and teaching activities in Uzbekistan. A visa for up to 3 months for foreign citizens who enter Uzbekistan for treatment at the invitation of a medical institution. A pilgrim visa is issued for up to 2 months to foreigners to study the cultural, historical, religious and spiritual heritage and traditions of Uzbekistan. You will need an invitation from a tour agency or the Committee on Religious Affairs. Uzbekistan is planning a joint visa with Kazakhstan called Silk Visa. No details yet, your questions and comments are welcome in the forum Silk Visa Q&A. When travelling in Uzbekistan, you need to be registered. If you fail to do so, you might have to pay a fine. Read all about it: Registration in Uzbekistan. In 2018, we heard of someone extending their visa for the first time in many years. So it is possible, but you will need to have a good reason. We do not know how to extend the visa. Previously, this was a big problem. With the new tourist-friendly rules, we do not know. You can probably get away with it. If you have an LOI, you can usually get the Uzbek visa the same day or the next day (see embassy reports for details of each embassy). If you do not have a LOI, it now takes 3 days on average. You can keep your passport when applying. Click the tab below to see all embassy reports. Foreigners can apply from 3-5.30pm on Monday, Tuesday, Thursday and Friday. It gets crowded, so make use of your foreigner privilege to skip the line. CHECK YOUR VISA before you leave the embassy, mistakes are sometimes made. It takes around 3 hours to collect your visa with LOI. Without LOI, it takes 1 week. Updates collected here. So I just got my Uzbek visa from the Almaty embassy a few days ago and actually it was not that bad. May 2018: 3-day and 1 week turnaround without LOI. February 2018: Took more than 2 weeks without LOI. 2015-2017: As before; painless procedure. Payment needs to be made at Centercredit bank nearby in tenge. Address: Sancak Mah 211 Sok. No3, Cankaya, N39.87226 E032.86352. Embassy is open 10-12.30 BUT Visa application/Collection only on Mon/Wed/Fri. Updates posted here. January 2017: Without LOI, it takes 8 days. February 2015: with LOI, you get the visa same day. September 2014: Smooth as before, but payment is now at Akbank, with a Turkish chaperone. May 2013: Super-friendly guy; no English. Applied Monday, was told it could take up to a week (without LOI). I asked if they could have it ready by Friday and they said that they’d try their best. Called me on Thursday at 8pm to say it was ready. $160, no visa support for American passport. You can pay at the local HSBC branch if you (or a friend or random Turkish stranger) can supply the bank with a Turkish ID number; otherwise you can make a direct deposit at the branch by Atakule. March 2013: British passport holders paid $80 USD for 1 month/multi-entry (even though we didn’t request it). $100 USD for 3 months. Applied on Tuesday filling out the form on-line and printing it. Picked up on Friday – 4 days processing with no LOI. Simple procedure with good English spoken and they took copies (supplied by us) of the passports during processing. July 2012: Filled out online application form, printed it and lodged on monday along with 2 photos and copy of passport, collected Friday, passport not kept by embassy. Fee paid to bank 10 minute walk away return with receipt and hey presto. $80 without LOI for British national. July 2015: arrived at 0900 and very busy outside Embassy, but were taken straight in for a new visa. The nice man just wrote the new dates we wanted on our original visa, stamped it and didn’t take any money! No problems at the border with the handwritten changes. Opening hours 10:00 – 12:00, 15:00 – 17:00 Monday, Wednesday, Friday. Embassy a little difficult to find, the GPS coordinates are: 40.3513°N / 49.80493°E. Find a route description here. Updates posted here. Uzbek embassy opening hours are flexible. Technically 10-12. Embassy staff helpful and spoke English. Check how long you can get as sometimes longer than 30 days window frame is possible if requested. If applying with LOI, same-day process. Without LOI, 7-8 days processing (be insisting!). Bus 32 comes close and drops you back off near the bank as well. Bank is International Bank of Azerbaijan, 67 Nizami Street, account AZ90IBAZ390200384094 26916120. IBA is next to German embassy just behind fountain square. There is free coffee and cold water in the bank and plush toilets on the first floor! February-April 2018: 3-day procedure without LOI, same-day with LOI. September 2017: Easy next-day process to change the dates on the visa, very nice consul. June 2016: Lost the application, waited 1 week for nothing and had to apply again. January 2015: 1 week processing without LOI, but consul only gave 28 days instead of 30. Very rude. June 2014: 30 day double entry tourist visa $85. Same day with LOI. April 2013: 5 days for the visa without LOI, 30 days, 1 entry, 75$. The embassy moved to Pathumwan, just behind the Vietnamese embassy, at this address: 83/4, Soi Vithayu 1, Wireless Road, Lumpini, Pathumwan District, Bangkok 10330. Consulate section opening hours are 10 – 12 and 15 – 17 on Monday, Wednesday and Friday. Updates collected here. February 2018: 2-day turnaround without LOI. Could keep passport. May 2016: Really nice guys. They agreed to take my papers and to send everything to Bishkek so as to begin the procedures. I called today the “really nice and friendly” lady from the embassy here. I had to call again 2 hours after but finally got the answer, the visa is ready, I have to go there tomorrow with application, photo and passport, to pick it up. May 2015: 8 days processing without LOI, expensive for Americans. September 2014: 8 days processing without LOI, can keep passport. Address: The embassy is located opposite the German embassy. Opening hours: Mo-tue-wed 9 -1pm. Updates in the Beijing embassy forum topic. July 2018: 5 day turnaround, they keep your passport. March 2014: French passport holder got a visa in 5 working days (applied on monday, got it the next one), applied without LOI. The staff asked for a letter from work. I told him I worked as a free lance (which is more or less true) and that I’m travelling for a year right now and want to travel the silk road to go home (I show him the stamps and visa on my passport), he then let me apply. It cost 600 RMB for a 30 days visa. March 2012: When we got there we had to fill in their application form, LOI, 1 photo, we handed it in on friday and picked up our passports on Monday. We paid 600 RMB in cash for 30 day single entry visa. We have Dutch and Spanish passports. Standard procedure. Updates posted here. New address, no longer on Tynystanov street! It’s in the South of town, on Mira Prospekt, next to the Oxford International School, very close to the Kazakh embassy. The entrance is via a gated residential area, to the right of the campus entrance. Then you walk to the left down a small street and the embassy is there, signed in Russian. It looks brand new. There’s a seating area to wait in a small courtyard, then you go in through the door when called. (GPS 42.833194, 74.583846). Tel: +996 312 66 30 78, +996 312 662 065. Opening hours: 10am – 1pm Monday to Friday, but Monday no visa service. The closest KICB bank is at 42.841097, 74.586218. You can also pay at the KICB bank on nearby Akhunbayeva street (map) or at the corner of Zhukeev Pudovkin Street and Aaly Tokombaev Street ( 42.826648 74.613847). The vicious power-happy sociopathic nightmare who was previously working here seems to have left (to hell, presumably). She occasionally might still pop in, though. The new embassy workers speak English and are, if not friendly, at least correct. The appointment system is still in existence (call the number to fix a date) but it seems to matter little as everyone’s appointment is now at 10am and people without appointment also just get in line. Best to just get there early. If you have an LOI, you can receive your visa on the spot (fill in your form before you come!). Without LOI, the process takes longer: around 4 days in 2017, previously 1 week. There is in effect no urgent processing. But if you tick the urgent box, then you will pay twice the fee and will receive a visa in the same time as anyone else. You can keep your passport while processing if you ask nicely. Need copy of Kyrgyz entry stamp and first page of passport as well as passport pictures and entry form filled in. Use Opera browser if the online form for visa application does not work. Updates collected here. Opening hours 10.00 – 13.00 Monday – Friday. Avenue Franklin Roosevelt 99. Updates collected here. Generally very smooth. January 2015: 30 day visa, 80 euros. Gave extra 15 day window to take up the 30 days without asking for it. Relaxed consul, prefers French, Russian. 10 day turnaround for application without LOI. Payed in cash on receipt of the visa. Also answers the telephone! February 2012: Quiet, relaxed embassy. 1-month visa cost 80 euros, with 6 days waiting period. You can get double entry for the same price. You need to pay by bank transfer and show the receipt when you pick up the visa, at which point the official starts filling in the visa. Open 9-12 Sun, Tues, Thurs. Consulate of Uzbekistan in Dubai locates in the “embassies area”, about 500m from Bur Juman metro station. Taxi drivers know the area. Next to consulate of Libya and right in front of the Lebanon Consulate. Currently open Mo, Th and Saturday from 9 to 12. They accept USD, but dirhams are preferred. Updates for Dubai are collected in this forum post. May 2018: The whole process took about 45 minutes with LOI. I recommend arriving early because the line was quite long by the time I left at 10:15am. June 2017: Very difficult process. February 2015: Turned up at 8.55, was in at 9, handed over LoI, completed application form, 2 passport pics and 315 dirhams (US $86). Visa was in passport 40 mins later. March 2014: Gets quite busy, so better to come early. With LOI, tourist visa took 2 hours. Cost 315 dirhams. Staff speak English. If you are polite they tend to reply the same way. Address: embassy has moved – now near Rudaki Street (map). Heading north on Rudaki Street take first left after Hotel Tajikmatlunot, embassy down 200m on the left. Consular hours 9-12 Monday to Friday. Updates collected here. It is no longer very busy in Dushanbe. Easy-going these days. October 2018: 3-day turnaround without LOI. March-May 2018: 3-day, 4-day and 6-day turnaround without LOI. Applications printed out on the e-visa form with one passport photo glued to the top right corner and a black and white copy of the bio page of the passport stapled behind it. Nothing else needed. We kept passports and were told to come back on Tuesday and pay then (if the visas are given). 2017: US citizens refused visa without LOI. 2016: All seems normal, on the spot with LOI, otherwise count on 1 week processing. April 2016: Applied by post from Switzerland. Took 16 days without LOI. April 2017: I applied in Islamabad, about three months before the planned entry. The person in charge seemed a bit surprised I applied so much in advance, but put no objections. The consulate is outside the diplomatic enclave, so very easy to access. Very few people visit this embassy, so no queues. Apart from the required documentation (online application, photocopies of all pages in passport with info), I also produced an introduction letter (example downloaded from Internet – not a LOI), explaining why I wanted to visit the country, and basically flattering them. After three working days I came back with my passport (you do not need to leave it there) and 75USD (I am German citizen), and voila! visa on the passport. Newest address: No. 8, Lale sk, Levent, Istanbul 34330 (map). You can get the metro to Levent station and it is a 5 min walk from there. Close by on Gül Sk, there is a little office there that will fill out the Uzbek visa application for you for a small fee. The bank is also located there to pay for the visa. Open Monday, Wednesday, Friday 10-12. Updates can be posted here. Standard procedure: same day turnaround with LOI, 1 week wait without LOI. Payment is at Akbank and is no longer a problem for foreigners since 2018. Urgent processing is 30$ extra but seems to have no effect. Updates reported in the Jakarta embassy of Uzbekistan forum topic. May 2018: They ask to call by phone the day before, which we did with the number they provided us in their mail. It took us less than five minutes (pick-up in Almaty week later). So smooth and friendly! Address: Taman Ampang Utama, 68000 Ampang, Selangor, Malaysia (map). Phone number: 0342532406. Open Monday, Wednesday, Friday 9.30-12.30. Working hours aren’t set in stone. Updates collected here. February 2017: same-day with LOI, without LOI bit more than 1 week. Updates posted here. Note that the Uzbek, Mongolian and Iranian embassies are all within easy walking distance of each other. June 2018: You can email them a scan of your application form (signed with photos on it) and the embassy will email you back when your visa is ready for collection. Then you take in all the forms listed on the website and get the visa stuck in there! May 2018: 1 hour turnaround with LOI. The embassy now accepts bank cards. July 2016: Applied with LOI. Sent by mail from Ireland, received it back in 2 days! June 2016: With LOI, visa was issued by the time I got back from the bank for an extra 15 GBP for priority processing. June 2016: Posted my passport and got it back 2 weeks later, no LOI. E-mailed a screenshot of online payment. 60 GBP. August 2015: Transit visa took 2 weeks to issue without LOI. July 2015: With LOI, embassy issued 30 day (fixed dates) visa within 5 days. Small office and sometimes a long wait. Payment in Barclays branch at your leisure. I think visa was £55. March 2012: Applying by mail to the London embassy took 2 weeks for a British national who didn’t need a LOI, and 1 week for an Australian national who did need the LOI. Updates posted in the Moscow Uzbek embassy forum topic. The entrance is at the east side of the building, in 2nd Kazachiy Pereulok (2-й Казачий переулок), close to the junction with 1st Kazachiy Pereulok (1-й Казачий переулок). Jump the queue. Visa service is supposed to work from 10h to 12h, but people start lining up before at the visa desk (desk 1, окно 1). I asked if it is possible to receive and pay for the visa in Almaty in January. No problem, he said. 3 working days. April 2015: Easy, 1 week turnaround. Updates posted in the New Delhi embassy of Uzbekistan forum topic. 2015 – 2018: Positive experiences, applications by mail. Turnaround between 2 and 7 business days, add another week in mailing time. Updates posted here. April 2014: 30 day, single-entry tourist visa given on the spot for US passport holder with LOI cost 175$ converted into rubles. June 2018: I could e-mail my application form to him and he would submit it to MFA for approval. 4 days later I found the visa status on the e-visa site had been updated. I then went to the embassy, handed in my passport and was given a slip of paper to transfer the visa fee. Payment at the bank is problematic, though. Reports and updates are collected at the Riga embassy forum topic. Address is 27, Daesagwan-ro 11-gil, Yongsan-gu, Seoul. Old address: Diplomatic Center #701, 1376-1, Seocho 2 Dong, Seocho-Gu, Seoul. The nearest metro stop to Uzbek embassy is Itaewon metro station. The visa is obtained immediately if applying with LOI. Without LOI, it’s a 14-day wait. Embassy reports are gathered in this forum topic. Address: Room 801, #258, Wu Song Road, Shanghai, China, 200080. Monday – Friday. 0930-1300, 1430-1700. Updates collected here. July 2017: Did not manage to e-mail them, but got it in 1 hour. Pay by cash or at the bank. May 2016: You can e-mail them the online form and a copy of your passport. Once approved, visa is made in 1 hour. Extra copy of the application form though and two passport photos is needed. Express 7 day visa cost 600 RMB – UK citizens. Normal cost is 300 RMB I think – we needed our passport for other visas. Keep persevering on the telephone number – it took us 2 weeks to get an answer! July 2018: You are advised not to send your passport to Singapore, as getting it back may prove an enormous hassle. July 2016: Very straightforward and hassle free. Open mornings only. I called ahead to enquire about opening hours and required docs. I (Swiss passport) brought along: Original passport, 2 passport photos, print out of the evisa application. I then had to go to a bank about 15mins walk away, pay the fee (85USD for double entry, 30 days) and e-mail a scan of the receipt. I dropped the docs off on Wednesday and the visa was ready for collection on the following Monday. Address: N10, Park 4 Dead End – Telephone: (021)222 915 19 or 021 222 99 780 – GPS N35 48.267 E51 28.534. It is a small street, going south from Aqdasiyeh street. Take the metro up to Nobonyad, then it’s a 16-minute walk. Not far from the Chinese embassy. The nearest copy shop is at 35 ° 47’54.19 “N 51 ° 28’29.85” E.
Opening hours 9 – 11 from Sunday to Thursday (often closed on Sunday though), best to get there before 9 to be at the front of the queue, or rather late (it seems no one gets left at the gate). Even better is to shout TOURIST! TOURIST! The ambassador has clear orders to prioritise tourists. Updates posted in the Tehran embassy forum topic. Application form printed twice, 2 photos, photocopy of passport and LOI if you have one. Previously, if you did not have an LOI, you needed a letter from your embassy, but this is no longer needed. You can change the dates of entry and exit when you come to pick up your visa, as long as it’s within the validity period of your LOI. You do not pay when applying, you do not leave your passport. If you have a LOI, you will get the visa on the spot, otherwise it takes 3 working days (previously 8 to 10). Pay in USD. Have a passport copy. Glue your pics onto the application. Print 2 copies of your application. You can skip the line as a tourist. Go up the stairs to the first floor. There’s the counter and the door. The consul will open the door every 3-5 minutes. Show your face. There’s no longer the famous ‘list’ were you write your name down so do make sure you go upstairs and do not wait outside on the street. Adress: The Uzbek Consulate is located a few blocks from Fudomae station (past Meguro on the Namboku line). Consular hours: 10:30-13:00 for drop off, 16:00-17:30 for pickup. June 2012: Cost for Americans: ¥16000 JPY for a 30 day tourist visa. This embassy is not recommended if applying by mail. Travelers applying in person report a quick and pleasant experience. Vienna updates posted here. July 2015: I just received my visa to Uzbekistan from the Washington DC consulate. I sent my application by mail from my home in Florida. The package arrived at the consulate in Washington yesterday. Much to my surprise, my passport, with the visa, arrived back at my home in Florida before noon TODAY. I was floored. Washington is 1600 kilometers from where I live, and the package didn’t arrive until noon yesterday in Washington. The consulate must have received it, processed my application, and mailed it out the SAME day. This is incredible service for any for-profit company—much less an consulate! I did not request expedited service…I was expecting to receive the visa in about two weeks. I did have an LOI just to be safe. March 2012: applying for a visa at the embassy in Washington by mail took 4 weeks.